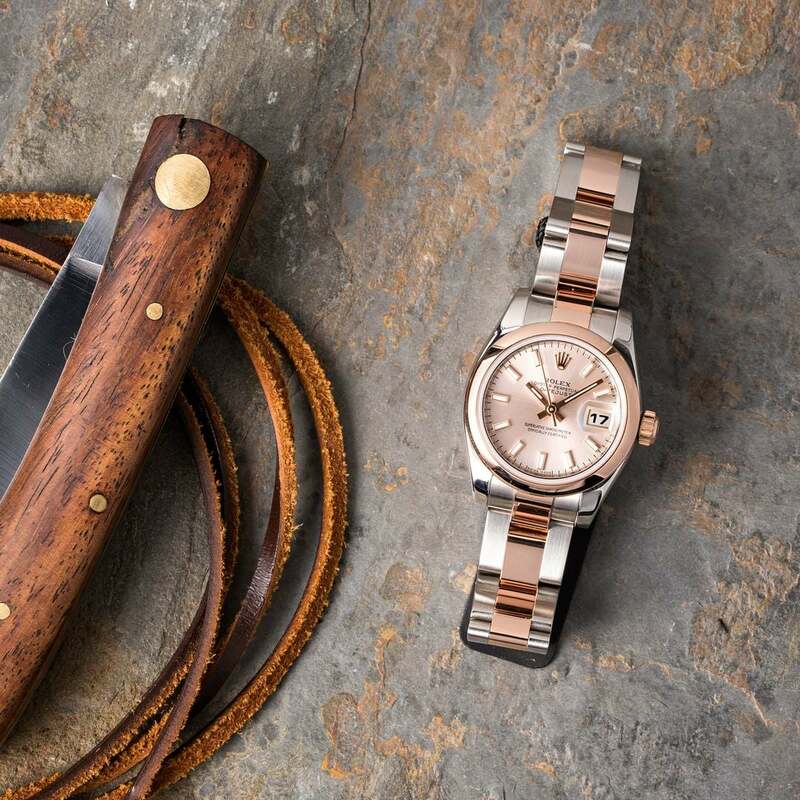 Rolex has been using rose gold in its designs for decades, but it wasn’t until 2005 that they started following standard Rolex operating procedure and brought its production entirely in-house. Forging the metal in their own foundry, alongside the yellow and white gold, the 950 platinum they use to craft their higher end pieces, they christened their new alloy — Everose Gold. 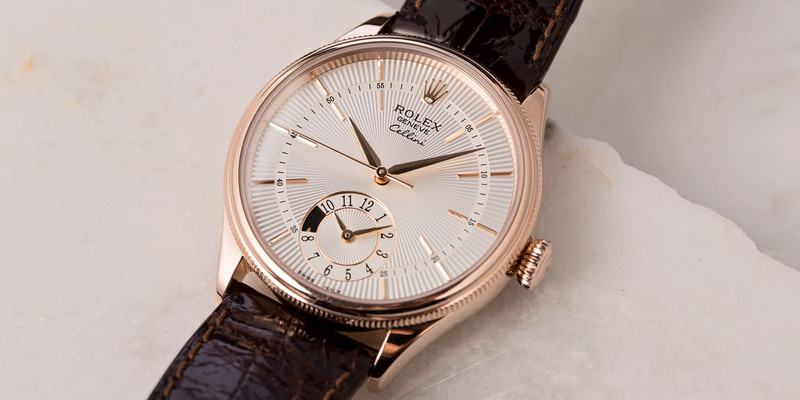 The pink gold of previous Rolex watches had been subject to fading over time, through exposure to elements such as saltwater or chlorine. 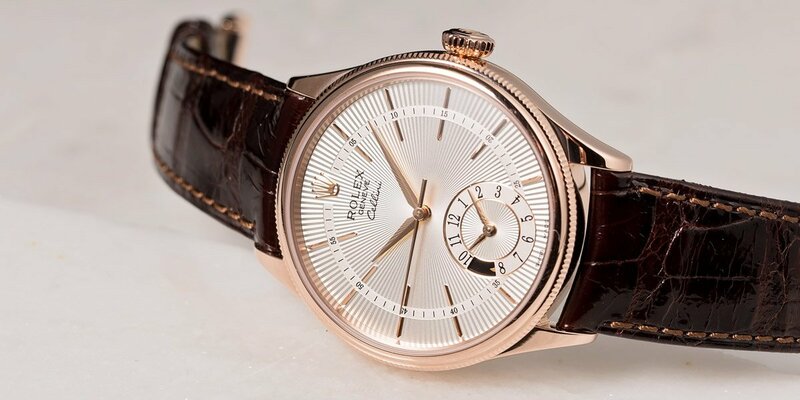 The Cellini is an Everose gold dress watch. Achieving its unique hue by blending 18k gold with copper, the only red metal element, the company solved the problem by adding small amounts of platinum into the mix to lock in the metal’s color. It means the rosy tint will always stay as lustrous as ever; ‘Forever Rose’—Everose. With a title like that, you could be forgiven for assuming the new blend was created specifically for Rolex’s range of ladies’ watches, so the brand worked hard to make sure it appealed to both men and women. As if to underline its masculine qualities despite the name, the first model to be released in the proprietary metal was the Rolex Chronograph Daytona. Since then, Rolex has released a carefully selected range of some of their greatest hits in Everose versions, with its color and warm glow proving hugely popular with both sexes. At Bob’s, there is a wide selection of authentic Everose Rolexes that are offered. Take a look through the online store and check them out. Rolex has created a unique formula to truly capture the pink hue on the Everose Gold. 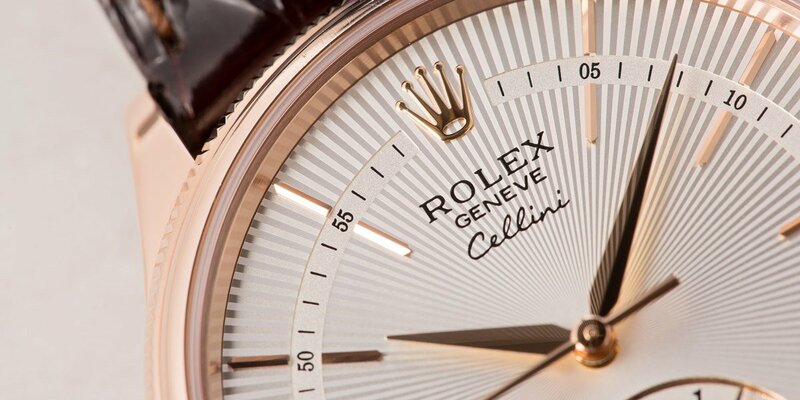 Rolex’s impeccable line of dress watches, the Cellini range is the epitome of sophistication. Ideal candidates for the refined style of an Everose case, the glowing pink tone matches with business or formal attire without the suddenness of yellow gold or the coldness of steel. Our ref. 50525 is a particularly special example of the collection. Complicated by dress watch standards, and especially by Rolex dress watch standards, it features a dual time display which also includes a day and night indicator. A small aperture in the sub dial’s nine o’clock position shows a sun on a white background to represent daytime in a different time zone, and a moon against a black background for the night. The beautiful Everose case, which, at 39mm, is surprisingly large for a dress watch, is topped with a striking double bezel. The coin edging is reminiscent of the fluted surrounds that distinguish certain editions of the Day-Date, but with an even greater degree of intricacy and elegance. The Everose Gold gives any watch a touch of elegance with its warm look from its material. Powered by the Cal. 3180, a derivative of the workhorse 3132 that drives the likes of the Explorer, the Cellini Dual Time has the faultless reliability we’ve come to expect from the Rolex brand, formed around an extra slim profile. The silver guilloche dial has a tasteful flamboyance; its applied hour markers are bisected by a delicate minute track, which, like its slender dagger hands, are finished in the same Everose gold as the case. With a design that has one eye very much on classic Rolexes of the past, even down to the slight dome of the early bubblebacks, the ref. 50525 is a modern vintage watch—a superb dress piece for the discerning business traveler as well as a great investment. The Datejust can keep up with the Cellini in this Everose Gold iteration. If only we all looked so good in our seventies. The Datejust has become Rolex’s longest-serving creation, a design born at the end of the Second World War that has retained its basic DNA for over seven decades. Last year saw the Datejust’s biggest shakeup in all that time, when the modern trend for oversize watches finally caught up with it and Rolex released a 41mm version of the quintessential classic. Now available in four sizes, there’s an edition to fit every wrist. Our ref. 126331 is one of the finest uses of the brand’s rose gold alloy. By contrasting its warmth with the implied strength of stainless steel in the Rolesor case and bracelet, we are left with a fresh take on a venerable classic. Coupled with a rich chocolate sunburst dial, it is a standout watch for people who don’t need to shout in order to standout. The Everose fluted bezel and subtle diamond accents on the hour markers add just a dash of extravagance, while inside, the new generation of caliber, the Cal. 3235, carries on the tradition of Rolex’s most widely-used movements in providing the ultimate in precision and reliability. The Datejust ref. 126331 is a thoroughly modern take on the most recognizable and illustrious Rolex in the company’s history. Its combination of elements gives it an understated masculinity and a versatile presence. One for both the discerning collector and lovers of the watchmaker’s art. 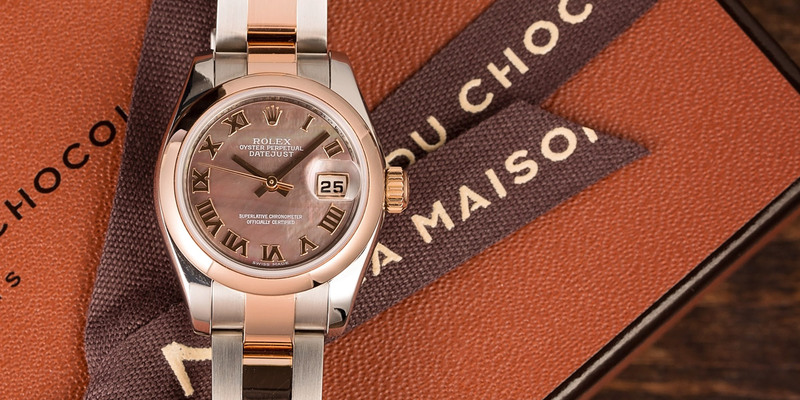 The Everose Gold Datejust for the ladies is a perfect choice for its luxurious tone. The first of the Ladies’ Datejust series was launched 12 years after the groundbreaking men’s watches put in an appearance. A scaled-down version of the all-conquering original, it soon proved itself just as popular with a female audience. Initially released as a 26mm model, it too has gone on to be offered in a range of different sizes to mirror changes in fashion. Our ref. 179161 is an unmistakably feminine example, in both size and design. Its diminutive case manages to look delicate without being fragile, and the Rolesor blend of Everose gold and 904L steel ensures it will match with a more extensive wardrobe selection. What are your thoughts on Everose Gold watches? The pinkish hue of the smooth bezel is echoed across the dial, highlighting the diamond indexes in their gold settings, and the whole watch sits securely on a flawless Oyster bracelet with Everose center links. Like its male equivalent, the Lady Datejust range is uncompromising in its functionality and the ref. 179161 is run by the Cal. 2235, from the series of calibers that holds the distinction of having the highest first time pass rate of any movement tested by the Swiss Chronometer Testing Institute (COSC). A striking blend of vintage design and contemporary technology, the Lady Datejust series is the essence of luxury and style. 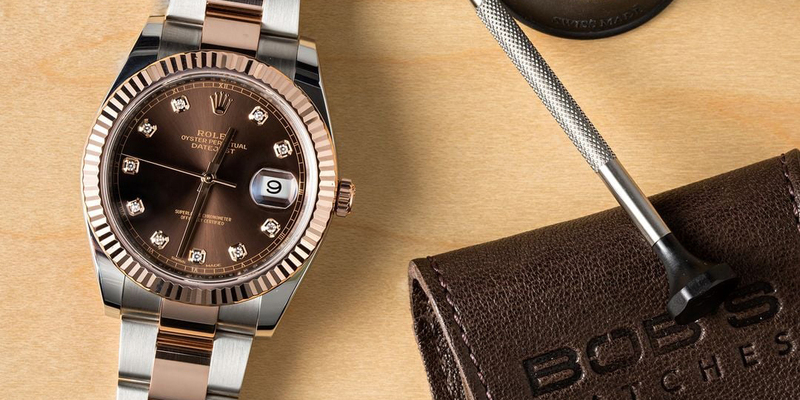 Everose gold has a unique warmth that gives timeless Rolex classics a renewed, updated aesthetic. As at home in the professional sports watch collection as it is among the formality of the Cellini range, its luster and subtle luminance bring something special to both the men’s and women’s lineup. 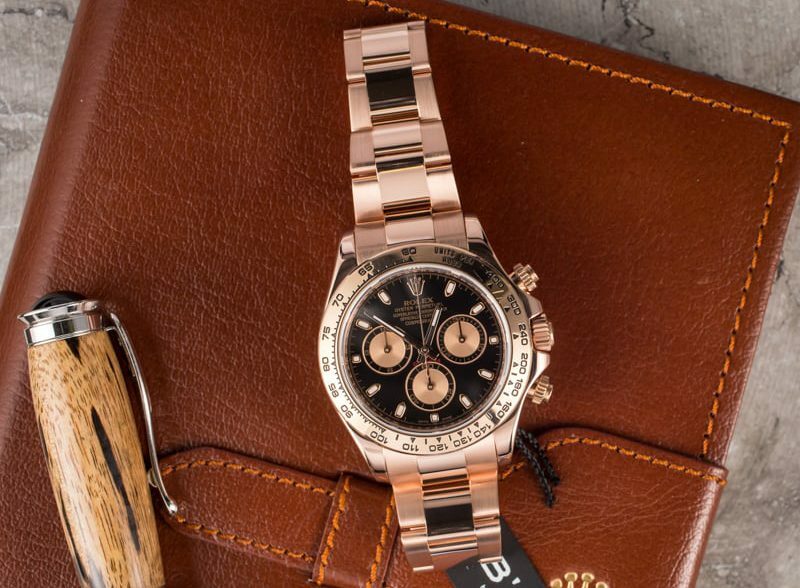 Or do you prefer the Rolex Everose Daytona?